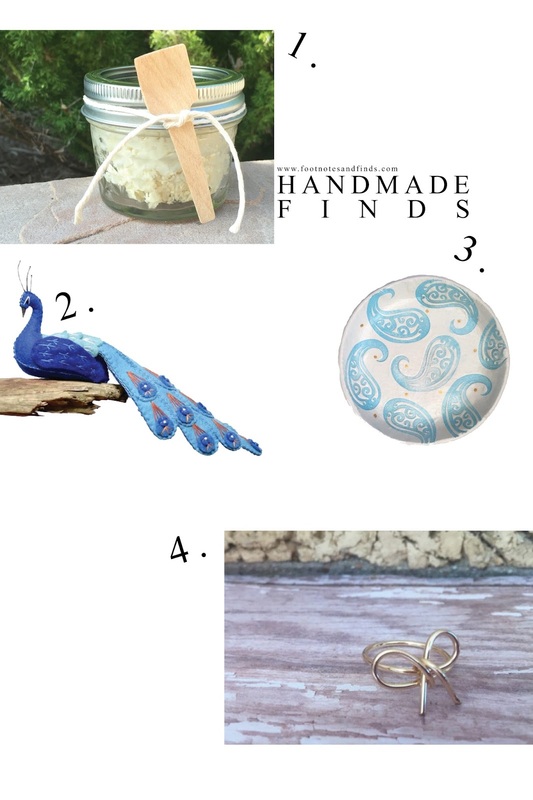 This is the third instalment of our Handmade Finds Series on the blog and it's becoming a staple! If you missed the previous ones check them out here. We are constantly amazed by all the artisans out there and the wonderful products they are creating. This month's handmade finds is a great example of that - we have everything from natural body products to jewelry! Inspired by my childhood years spent on my grandparents' Southern California palm tree and succulent nursery, I'm bringing my love of botanicals to custom-made skin concoctions with Full Bloom Beauty. Full Bloom Beauty features handmade whipped body butters, bath salts and scrubs made using only pure, all-natural botanicals inspired by the native landscape of California. I never use water, preservatives or fillers. I tap into local ingredients like avocados, citrus, lavender and rich florals, in addition to nourishing cocoa and shea butter to develop highly concentrated beauty blends. All my goods are designed to enrich and brighten the skin to give women a Southern California glow! Full Bloom WhippedCocoa Glow Body Butter is a highly concentrated blend of all-natural ingredients inspired by our love of pure, simple botanicals. No Water, No Preservatives, No Fillers. My name is Jill Ffrench and I love making felt birds that you can find for sale in my Etsy shop Fantails and Feet. Having been drawn to the natural word from a young age, it is my memories of the stunning peacocks that strut around India's ancient palaces and temples and are now a source of inspiration for my complex bird patterns that I make today. I choose to only ever to work with 100% wool felt for its fine fibres feel so soft between my fingertips and the decorative embroidery stitches that I use are simple but form elegant tail or wing patterns that can hold their own. I am not interested in using any kind of glues or synthetic fibres that do not biodegrade. This gorgeous, soft ornament is my unique design, made using the finest colours in quality pure wool felt and alpaca wool. 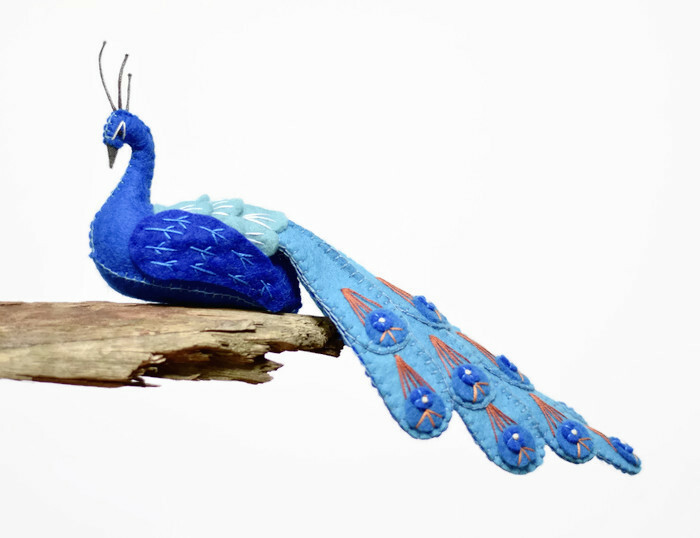 The brilliant blue coloured felt works perfectly with the warm orange embroidery stitching on the tail, making it a wonderful addition to your home. From the regal crown to the tip of its tail, it measures 25cm (10 inches). The width of the tail is approximately 11cm (4inches) wide, the perfect size to perch elegantly atop a shelf or bookcase. To keep its splendid shape in tact I use a combination of various types of wire, and I also use a small stone deep inside the body to balance it beautifully. ever expanding, including beautiful bespoke handcrafted gift frames. A cute handmade trinket dish that can be used in various rooms in the home, for decor and functions to hold your little trinkets or jewellery. It has been made with air dry clay, shaped and left to thoroughly dry for 2 days. 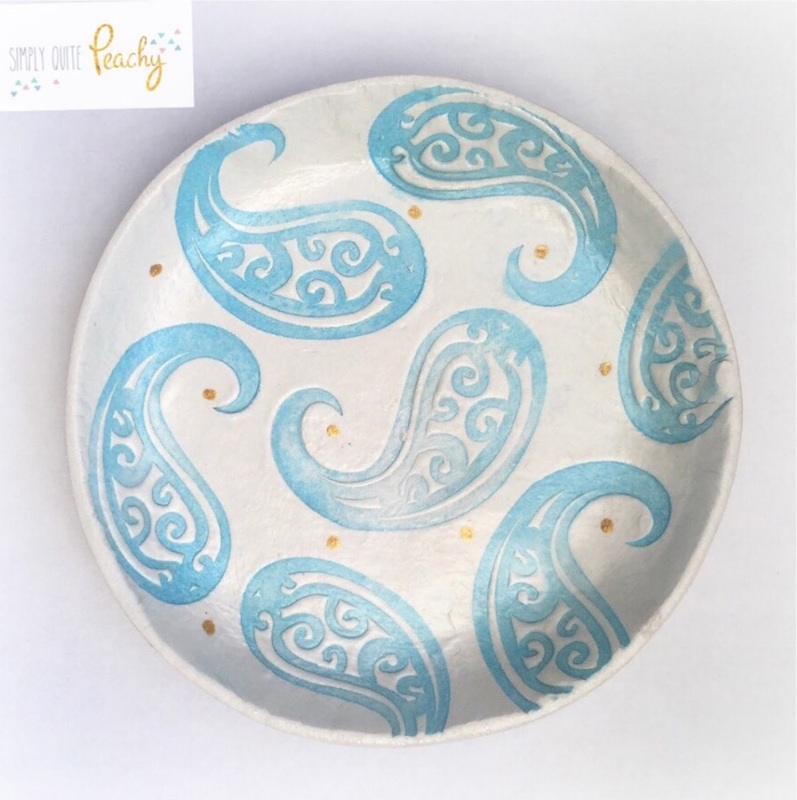 The dish has been carefully imprinted with a blue, Paisley design, and liquid-metal gold polka dots. It is approximately 10cm in diameter, has been sealed, and then glossed with a high quality varnish. Rose Water Designs- Valentine's Day Jewelry, Coordinates Pieces, Hand-Stamped Jewels, Personalized gifts perfect for Weddings & every darn day! Handmade sterling silver jewelry, gold filled jewelry, Bohemian inspired pieces, bridesmaid sets, bridal jewelry, gold layering pieces & more. All made right in West Michigan. This shop features trendy, must-have handmade jewelry. All pieces are made with care with the highest quality of sterling silver, gold filled and 14K gold metals. All pieces are made to order for the unique & lovely YOU. Each item arrives gift boxed in Rose Water Designs packaging. 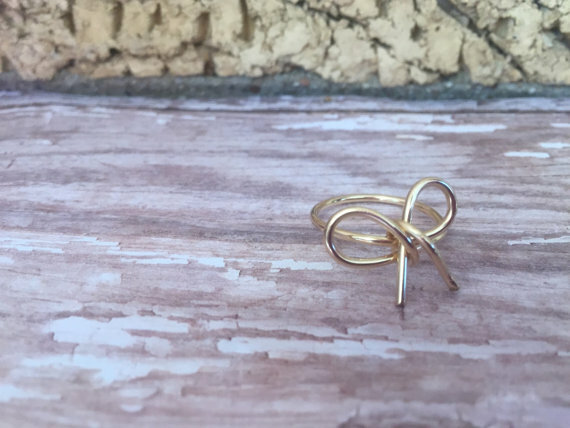 The handmade Forget Me Knot ring nothing but easy-to-wear style. This ring is completely hand-formed and wrapped from one continuous piece of gold filled wire. All sizes can be ordered below! Give to a bridesmaid with a "help us tie the knot" message attached. Or to anyone special with a "forget me not" message attached. I'm always happy to help with this! Packaging is my favorite! Ring is handmade using 18 gauge gold filled metal wire. I love these handmade finds! I'm all about handmade and natural beauty products, so I'll definitely be checking out Full Bloom Beauty. That ring from Rose Water Designs is also very pretty! Thanks for sharing these picks! Amazing handmade items!! Love that peacock so much!! These are so cute and would make amazing gifts!